Introduction – The history of Sittanavasal or Pudukkottai region can be traced from very ancient times as many burial sites are found in nearby areas. It would have been a Jaina pilgrimage site in olden days as supported by the presence of Jaina beds on top of the hill. Jaina character of the site continues till ninth-tenth century CE as beds were carved out in those times for ascetics. T N Ramachandran suggests that the present name Sittanavasal is probably derived from Sanskrit words ‘Siddhanam’ + ‘vasah’ which means ‘abode of siddhas’. However K R Srinivasan states that Sittanavasal is a Tamil name and was in use during the Sangam period. Monuments – There are two ticketed monuments under ASI (Archaeological Survey of India) at Sittanavasal. There are few shrines in the village which are dedicated to village gods. Jaina Beds (Eladipattam) – A strenuous path takes you to the top of a low rising hillock where seventeen polished bed are carved out under a low hanging roof. These beds were used by Jaina ascetics who were involved in severe austerities such as kayotsarga and sallekhana. These beds have a raised portion at one end forming a kind of pillow. There are inscriptions on few of the beds which date from third century BCE. There are inscriptions of ninth century CE which suggests that the site was in use at least till that time. 1. No 1 of the Inscriptions of the Pudukkottai State – On a stone bed – Written in Brahmi in 2 lines – dated to beginning of third century BCE – Records that Chirupochil Ilayar made the Atitnam (Adhittana) for Itan who was a kavidi born at Kumuthur in Eomi-nadu. 2. No 388 of the Annual Report on Epigraphy 1914/No 7 of the Inscriptions of the Pudukkottai State – On a stone bed – Written in Tamil, Brahmi in 7 lines – dated to eighth or ninth century CE – The label gives the names of some persons (probably Jaina ascetics): Kadavulan Tirunilan of Tolakkunram, Tiruppuranan, Tittaichchanan, Tiruchchattan, Sripurnachandiran, Niyatakaran Pattakkali and Kadavulan. Arivar Koil – It is not very sure if this place was ever in control of the Pallava-s however a cave temple similar to Pallava style was excavated in seventh-eight century CE, probably, and was dedicated to Jaina tirthankaras. It was an accepted fact that the Pallava king Mahendravarman I (580-630 CE) was a Jaina and later he converted himself to Shaiva under influence of saint Appar. In the similar manner, a Pandya king also got converted from Jaina sect to Shaivism under influence of another saint Sambandar, who was contemporary of Appar. Is this cave excavated by Mahendravarman I when he was Jaina? In this case, the inscription at Mandagapattu which proposes that it was the first cave by the king does not hold true. If the inscription at Mandagapattu is taken in same manner as suggested by K R Srinivasan that it declares that Mandagapattu was the first such shrine constructed by the Pallava king, then it become evident that Sittanavasal cave was probably a work of the Pandya artists. In that case it could be the work of either the Pandya king Maran Sendan (654- 670 CE) or Arikesari Maravarman (670-700 CE). It is suggested that it was Maravarman who also got converted from Jaina to Shaiva under influence of Sambandar. Extension of the cave in ninth century under a Pandya king suggests that though Pandya kings were Hindus but they supported other religions without any malice. This west facing rock-cut temple has been excavated on the western face of a rock. Originally it was excavated with a ardha-mandapa and a cubical cell. This ardha-mandapa is supported on two pillars of characteristics Mahendra-order. It measures, with its ardha-mandapa, 20.5 m long, 2.28 m wide and 2.5 m high. The cubical cell measures 2.89 m side. The shrine was extended with a pillared mandapa during the reign of the Pandya king Srivallabha (815-862 CE). However this mandapa was already destroyed when renovation was taken over for this in 1942. On the base of the ruined mandapa, a new mandapa was erected during the renovation at this site with four pillars taken from another ruined mandapa at Kudimiyanmalai. North and south walls of the ardha-mandapa have an image of Jaina tirthankara. Tirthankara on north side does not carry any cognizance so it’s hard to identify him. However there is an inscription on nearby pillar which reads Sri-Tiruvasiriyam, meaning ‘revered teacher’. This suggests that he was not someone from the twenty-four tirthankaras but some other revered teacher. Or it is also probable that he represent one of the twenty-four teachers and his cognizance was painted instead of carved on the image. Tirthankara on southern wall is shown seated under a serpent hood suggesting that he is the twenty-third Jaina tirthankara, Parsvanatha. An inscription on nearby pillar face reads [Ulo]kaditan, meaning ‘ruler of the world’, which aptly appropriates with the image. 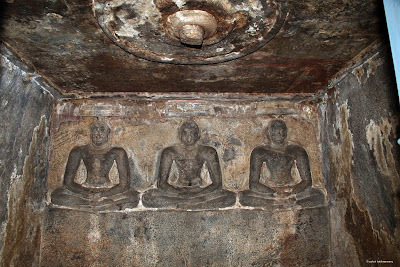 There are three images, seated under umbrellas, of tirthankaras or teachers inside the sanctum, on back wall. Image on northern end and in center has two umbrellas above but image of southern end has only one umbrella. This suggests that the former two might have been images of some tirthankaras while the latter would be of some revered teacher. However as there are no cognizance on any image so it is hard to identify any one of these. There is a possibility that the cognizance were painted on the images, and if it is so, there is no trace of those paintings at present. 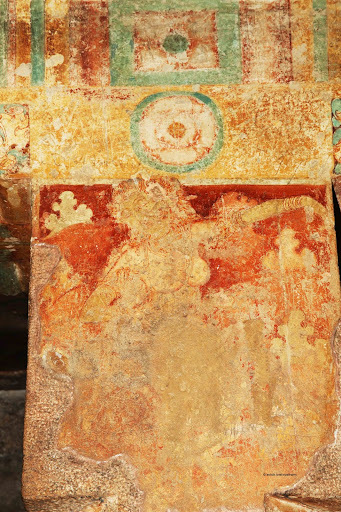 Ceiling of the sanctum was once covered with paintings however at present very few traces are left. Stella Kramrisch reports that there were two layers of painting, one over other, on the ceiling. She suggests that both the layers were done at the same time however K R Srinivasan reports that the first layer was coeval with the cave however the second layer was done probably during the extension carried out in ninth century CE. There is a unique vibration/echo effect observed when you repeat ‘Om‘ sound inside the sanctum. If you are not able to feel this then ask the caretaker of the site as he is very good in doing this. Paintings – To the external world, paintings at Ajanta Caves are probably the only examples of Indian Murals however extensive studies carried out all around India in this dimension has proved that the tradition which was started at Ajanta was actually started way back in ancient times. And it did not end with Ajanta but carried forward by people of different faiths at many parts of India. Oral traditions which were probably carried from much ancient times were first documented in Kamasutra of Vatsyayan which is dated to third century CE. He defines ‘shadanga’ or ‘six limbs’ of Indian painting art. A later but more elaborate work, Chitrasurta of Vishnudharmottara Purana, dated to fifth century CE, details about the techniques and art of painting. Mention of various kinds of paintings is found in old Sanskrit literature. Malvikagnimitram and Abhigyanashakuntalam of Kalidasa talks about portrait paintings of their heroines. Uttara Rama Charitam, a drama written by Bhavabhuti in sixth century CE, has a whole scene of the first act dedicated in describing a picture hall where various paintings of Ramayana were painted. Sittanavasal is the earliest example of Jaina paintings. These paintings came into the attention of scholars after an inscription was published in ARE (Annual Report of Epigraphy) 1904. An earliest study was carried out by Venkataranga Raju, the then curator of the Pudukkottai Museum, who made water color reproductions of these murals in 1910. T A Gopinatha Rao reported to his friend Dubreuil in 1919, “These paintings are as old as the shrine and are in fairly good state of preservation and need being copied fully”. 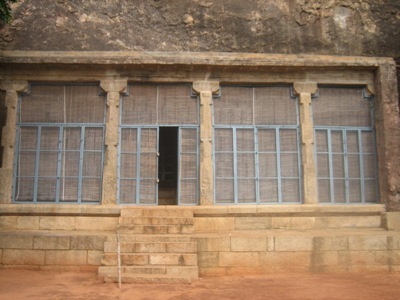 Dubreuil later reported that the cave was a work of the Pallava king Mahendravarman I (580-630 CE), probably based upon the style of pillars. He suggested that the ‘lotus tank’ painting is probably related to some event in Jaina history and the paintings of dancing girls to those of devadasis or dancers of the temple. However we do not have any instance of devadasis in Jaina temples. As water color copies of Venkataranga were not appropriate so Rama Prasad of Bharat Kala Parishad made another attempt to copy these murals in water color in 1925. 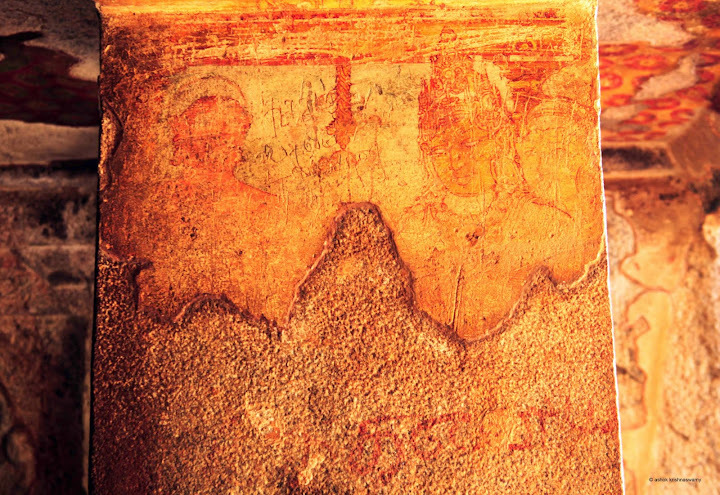 The idea of the Pallava origin, as suggested by Dubreuil, of these frescoes was carried forward by N C Mehta and T N Ramachandran who discussed these frescoes in their respective papers and studies. It was T N Ramachandran who suggested that the lotus tank probably depicts khatikabhumi region of Samavasarana. Stella Kramrisch agrees with the identification by T N Ramachandran about the lotus tank mural. 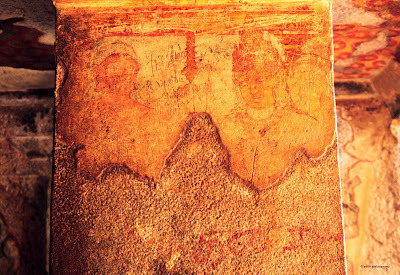 She also agrees with T A Gopinatha Rao that the paintings were coeval with the excavation of the cave. K R Srinivasan was involved in renovation work which was carried out in 1942. He agrees with Dubreuil about the Pallava features of the cave and suggests that the cave underwent some modification under the Pandya rule as suggested by an inscription. There are four beautiful article on paintings of Sittanavasal written by Vijay on www.poetryinstone.in. I would strongly recommend those article as you will get immense information on these paintings. These articles are linked in web references down in this article. I will talk only in brief about these paintings. Many thanks to Mr Ashok Krishnaswamy who permitted me to use his pictures in thsi article. There are two dancers painted on western face of the two pillars such as greeting people who enter the cave. These apsaras or celestial maidens are carved very suggestively however the images are much weathered now. Only upper portion of the dancers remain. Apsara on northern pillar is shown in a dance posture known as Talasampohita Karna as suggested by Thomas. In this posture, left hand is stretched across of breasts to reach waist portion on the right while the right hand is bent at elbow and folded upwards near breasts similar to abhaya mudra.A dance posture or karnana as defined in Natyashastra of Bharata is about the position of hands and legs. As only torso portion remains of this painting hence position of legs is not very clear. T N Ramachandran identifies this posture as Latavrischika. Behind her are shown clouds such as she is dancing in sky and probably coming downwards to the earth. Her hair are tied together and is adorned with varieties of flowers. She wears few necklaces around her neck. Though her torso portion only remains however it seems that she is wearing clothes below her waist however her upper portion is bare. Thomas suggests that the Apsara on southern pillar is shown in a dance posture known as Ardharecita Karana. In this posture, the left hand is stretched outside while right hand is folded against breasts. However this posture is very similar to Bhujangatrasita Karna which is very properly depicted in an early Nataraja form at Seeyamangalam. Though leg positions of the apsara are not very clear however it seems that her one leg is raised up while other is rested on platform. This kind of leg position is usually seen in Bhujangatrasita Karana, however I am not an expert on dance karanas. She wears a tiara and flowers garlands over her shoulders. Clouds are portrayed behind thus suggesting her celestial character. On the same pillar, on north face, is a painting of a royal couple with a monk. K R Srinivasan identifies this painting with the meeting between Ilan Gautaman and the Pandya King, Srivallabha, accompanied with his queen. Ilan carried out repair and extension of this shrine during the reign of the Pandya king, Srivallabha, hence it is not strange that the king came to pay homage and check out the work. Queen is depicted shorter than the king which is as per the canons where a lady is usually depicted shorter than a man. King is wearing a long crown and many ornaments on his chest. Only face of the queen is shown as she stands in shadow of her husband. There is a cornice with kudu behind the king and queen, which suggests that they have come to pay tribute to the shrine. Though we do not see any kudu now however the original extended mandapa is destroyed and the present one is only done in 1942 during renovation of this shrine. 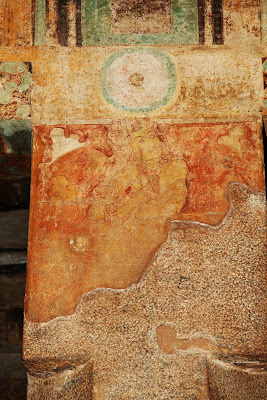 Most of the ceiling of the mandapa is covered with a mural painting of a lotus tank which has been identified as Khatikabhumi region of Samavasarana of Jaina mythology. This Khatikabhumi represents a region filled with lake. A lake has been painted in this mural depicting a scene of a dawn perhaps. This lake is mostly filled up with lotus flowers. These flowers attract viewer’s attention due to their sheer size and bright colors. This bright color fades gradually towards inside of flower. These flowers are depicted in various stages of development, from a bud to a well blown flower. The bright red lotus with green leaves and thin stem presents a very pleasant sight for eyes. There are many fishes swimming across this lake amidst the lotuses. Thomas suggests that these fishes are mostly of murrel category as evident from their size and colors. He states that murrel fish has been associated with marutam region where there size indicates the prosperity of the town. There is a crocodile as well among fishes who is observing the activities around it. Thomas states that crocodile is associated with neytal (ocean) region in Sangam poetry. Crocodiles are not considered danger for human beings during the Sangam period. There are many birds shown perched on leaves. Thomas suggests that these resemble with water-hen which are very frequent in Tamilnadu ponds. As these do not have webbed legs so water-hen seems to be appropriate identification. They are shown in a state of anxiety as they feel afraid for their chicks and hence they are whipping their wings so that to be ready for a fly if danger approaches. There are three buffalos in this lake, one totally submerged and two in state of getting out of the lake as men approach. There are three men in the lake who are shown collecting flowers. Elephants are shown carrying lotus stems and in process of handing those to nearby men. One of them is holding a basket to place flowers into it. These men probably represent Jaina monks who are getting flowers for offerings to their teachers. Smile on their faces suggest that they are content with their booty. Thomas points that Samavasarana is usually depicted in full but not in single regions. Hence identification of this mural with ‘khatikabhumi’ is based upon very slim evidence. He further suggests that the Tamil Jaina literature composed around the same time associate lotus flower with Arukan, the jina. Arukan is called as Thamaraippuvin mel sentran meaning ‘one who walked on the lotus’ and Thandamarai mel nadanthan meaning ‘ one who walked on the cold petals of the lotus’ etc. This suggests that a lotus offering to Jaina teachers was considered very auspicious and hence a depiction of lotus collection in this shrine is most appropriate. Samavasarana – Samavasarana (sama + avasarana) which means equal opportunities for all. Samavasarana, in Jaina literature, is used for an assembly of a tirthankara. This assembly is in form of an ordered congregation of different beings assembled to behold the thirthankara and hear his discourses. When these different beings, humans, animals and gods, gather together at one place for one purpose, this eliminates differences among them and place them on equal platform thus forming a Samavasarana. A Samavasarana can be taken as a tirth, revered place, which is made holy with the presence of a tirthankara. Art of constructing a Samvasarana is detailed in Jaina literature. These scriptures explain what is Samavasarana, how it is created, who creates it, when it is created and how long it is held by a tirthankara. Coming under the aura of a tirthankara is everybody’s aim and to accommodate this a Samavasarana is constructed. It is in form of a platform or a pavilion with three concentric circles and their well defined properties. Sometimes this could be a square instead of circular in shape. A Samavasarana is constructed when an ascetic attains keval jnana (ultimate knowledge). Twenty-fourth and the last tirthankar, Lord Mahavira, attained this kewal jnana after severe penance of twelve and a half years. A Samavasarana was constructed to commemorate this occasion. The Mahardhik gods inform the Abhiyoga gods about the place (village, town etc) where a Samavasarana is to be constructed. Then Abhiyoga gods clean an area of one yojana (approximately 12 square km). They sprinkle fragranced water and flowers and make area suitable for holy congregation. Then Vyantar gods construct four gateways with gems having various auspicious figures on these. These gems with inlaid figures are constructed by Bhavanpati gods. Innermost enclosure and its decoration is constructed by the king of Vaimanik gods while the outermost enclosure is constructed by the king of Jyotishka gods. Ishan gods then plant an Ashok tree which should be twelve times the height of the tirthankara. This tree is planted on a platform, Gandhakuti, constructed with gems and on its center is installed a throne. Over the throne are constructed three canopies. Balindra and Chamar gods stand on either side of the throne with fly-whisks. In the last, Vyantar gods installed the wheel of religion at some distance in front of the throne. This completes the construction of the pavilion. A more elaborate plan is specified in ‘Paintings in Tamilnadu’ by I J Thomas. Enclosure around the central Gandhakuti is called Lakshmivara-mandapa where twelve niches for various people. There are seven different regions around this Gandhakuti, each of which is enclosed by a rampart (vedika). These are Chaityaprasada Bhumi for palaces and temples, Khatika Bhumi for lakes, Valli Bhumi for forests, Upavana Bhumi for gardens, Dhavja Bhumi for flags, Kalpavriksha Bhumi for Kalpavrikshas (wish fulfilling tree of heaven) and last Bavana Bhumi for pavilions. A person has to pass through these seven regions to reach his repective niche to hear sermon of the tirthankara. The tirthankara enters into it through its eastern gate and take his seat in the innermost circle facing east. Gods create three replicas of the tirthankara and place in other three directions so that he is equally visible to whole assembly. Senior most principle disciples sits near the feet of the tirthankara while senior gandharvas sit near his feat in south-east direction. Other gandharvas sit at his other sides. Then enter omniscient ascetics, Kewal Jnanis, who enter through the eastern gate and circumambulate the tirthankara first finally sitting behind gandharvas. Then enter other endowed ascetics like Manahparyav Jnanis, Avadhi Jnanis, Fourteen Purvadhars and other Purvadhars who circumambulate thrice around the tirthankara and take their seats behind Kewal Jnanis. Then enter female ascetics and stand behind Vaimanik gods’ seats. Then enter other goddesses, from eastern gate come goddesses from Vaimanik dimension and stand behind common ascetics, from southern gate come goddesses from Bhavanpati, Vyantar and Jyotishka dimensions and stand in south-western direction in the said order of entrance. Then enter gods from these three dimensions, Bhavanpati, Vyantar and Jyotishka, from eastern gate and take their seats in north-west direction in same order. Then enter gods from Vaimanik dimensions, from northern gate, with their attendants and families. This is how the first enclosure is occupied. The second enclosure is occupied with animals who have five senses. The third enclosure is used to park vehicles of gods and others who come to attend Samavasarana. Inscriptions – There are many inscriptions, mostly small label inscriptions, in and around this cave shrine. Few of these are detailed below. 1. No 328 of the Annual Report on Epigraphy 1960-61 – On the sloping edge of the rock to the south of the cave on the western slope of the central hill – Written in Tamil – dated to seventh century CE – This label reads as :Sri-pirutivi[na]chchan. 2. No 331 of the Annual Report on Epigraphy 1960-61 – On the sloping edge of the rock to the south of the cave on the western slope of the central hill – Written in Tamil – dated to seventh century CE – This label reads as : Vitivali. 3. No 324 of the Annual Report on Epigraphy 1960-61 – On the northern side of the base of the verandah of the cave – Written in Tamil – dated to eighth century CE – This label reads as : Sriyankala. 4. No 368 of the Annual Report on Epigraphy 1904/No 45 of the South Indian Inscriptions vol XIV/No 398 of the South Indian Inscriptions vol XVII – On the rock south of the cave temple – Written in Tamil in 17 lines – damaged – dated to unknown regnal year of the Pandya king Sirivalluvan (Srivallabha), approximately to 815 CE – Records that Ilan-Gautaman (who is referred to as an asiriyan of Madurai) repaired the agamandapa of the temple of Annalvayil and built the mukha-mandapa in front of it on behalf of the Pandya king Sirivalluvan (Srivallabha) who had the title Avanipasekharan. Some gifts of land also appear to have been made to the priests of the temple, the details of which are not clear as the record is damaged. The record is composed of verse. How to Reach – Sittannavasal is located on Pudukkottai-Annavasal-Viralimalai main road about 16 km from Pudukkottai. The village lies to the right of the road from Pudukkottai to Annavasal. There are few buses plying on this route, better to take a private taxi. Havell, E B (1908). Indian Sculpture and Painting. London. John Murray. Kramrisch, Stella (1954). The Art of India. London. The Phaidon Press.